1918 - Republic of Czechoslovakia proclaimed. Tomas Masaryk elected president. 1935 - Masaryk succeeded as president by Edvard Benes. 1938 - Munich Conference results in cession of the Sudetenland to Germany. Benes resigns. 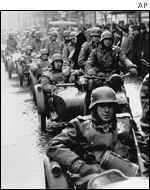 1939 - Nazi invasion of Czech Lands which become a German protectorate. Slovakia is proclaimed an independent state under profascist leader Jozef Tiso. 1940 - Benes establishes government in exile in London. 1945 - Soviet troops enter Prague. Benes returns and issues decrees which lay the foundation for the expulsion of over two and a half million Sudeten Germans and more than half a million ethnic Hungarians. 1946 - Czechoslovak Communist Party (CPCz) leader Klement Gottwald becomes prime minister in power-sharing government following national elections. 1948 - Communists organize wave of mass protests and strikes. Government crisis leaves Communists with majority in government. Benes resigns as president. Gottwald succeeds him, imposes Stalinist-style rule, complete with party purges. 1952 - Leading Communist figures, including former party Secretary-General Rudolf Slansky, executed having been convicted of treason and espionage at show trials. 1953 - Gottwald dies of pneumonia just days after attending Stalin's funeral. Antonin Novotny succeeds him as CPCz leader, Atonin Zapotocky as president. 1957 - Novotny becomes president after Zapotocky's death. 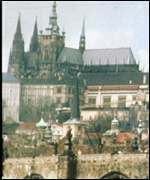 1960 - Czechoslovakia becomes Czechoslovak Socialist Republic under new constitution. 1963 - Slansky and other victims of Stalinist purges rehabilitated. 1968 January - Alexander Dubcek succeeds Novotny as CPCz leader, embarks on programme of liberalizing reforms known as Prague Spring with the aim of ushering in "socialism with a human face". 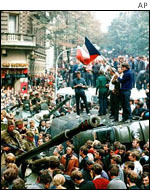 1968 August - Soviet-led Warsaw Pact troops invade. Dubcek taken to Moscow and forced to make concessions before returning to Prague to make an emotional plea for cooperation in ending the reforms. 1969 January - Student Jan Palach burns himself to death in protest at occupation by Warsaw Pact armies. 1969 April - Gustav Husak replaces Dubcek as CPCz leader. 1975 - Husak becomes president. 1977 - A group of dissidents including playwright Vaclav Havel publish Charter 77 calling for restoration of civil and political rights. 1987 - Milos Jakes replaces Husak as party leader. 1988 August - Mass demonstrations mark the anniversary of the 1968 invasion. 1989 - Police disperse numerous mass protests against human and civil rights violations. 1989 November - Peaceful mass protests and strikes gain momentum. The Civic Forum, a broad antigovernment coalition, formed. CPCz leadership resigns. Federal Assembly abolishes Communists' constitutional hold on power. 1989 December - Marian Calfa becomes prime minister in a government in which the majority of members are non-Communists. Husak resigns as president. 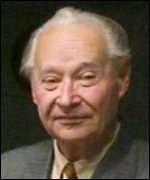 Dubcek elected chairman of Federal Assembly. 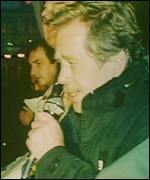 Vaclav Havel elected president, completing the "velvet revolution". 1990 - Country renamed Czech and Slovak Federative Republic. First free elections since 1946 lead to establishment of coalition government involving all major parties with the exception of the CPCz. Havel re-elected president. 1991 February - Civic Forum disbanded. Members form two new parties, the conservative Civic Democratic Party (CDP) and the liberal Civic Movement. Legislation allowing privatization of state-owned enterprises approved. 1991 June - Soviet forces complete withdrawal. 1992 June - Elections see Czech voters backing the centre right while their Slovak counterparts support Slovak separatists and left wing parties. Vladimir Meciar, an ardent supporter of Slovak separatism, becomes Slovak prime minister. He is strongly opposed to the rapid privatization of the public sector proposed by Czech Prime Minister Vlaclav Klaus. Negotiations between Klaus and Meciar reach deadlock as neither is prepared to compromise. The two agree to the separation of Slovakia from the Czech Lands, despite the objections of President Havel and a general lack of popular enthusiasm. Havel resigns as president after Slovak separatist parties block his re-election. 1992 November - Federal Assembly adopts legislation enabling the federation to disband. 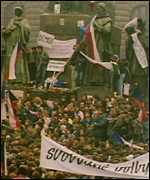 1993 1 January - Czechoslovakia completes "velvet divorce" which results in two independent countries, the Czech Republic and Slovakia.